Have you ever made torn paper art? It’s really easy to do and very effective. We had lots of fun making these torn paper mountains. We used torn paper art to make mountains for my Winter Art & Sensory Challenge. My kids talked about the shapes they needed to tear to recreate a mountain range. It took a while to master the skill of tearing at the right angle! Have you tried torn paper art? 🏔 We looked at some mountain range photos. My kids were fascinated by the different colours and textures of mountains. So we used fabric scraps to collage some mountains too. 🏔 The fabric all came from our local scrap store. I love scrap stores! They’re a real treasure trove for art and craft finds. Have you used one? Look at a picture of mountain ranges first. Discuss the shapes of the mountains and the texture. Pick several different shades of paper. Hold the paper flat on the table with one hand, pull the top of the paper at an angle as you tear, zig-zagging up and down to create the shape you want. Glue each piece of torn paper onto a blue piece of paper in layers. The blue paper will become the sky. Vik Muniz is a Brazilian artist and photographer who recreates famous art using objects such as torn magazine pages, thread, chocolate syrup and rubbish. 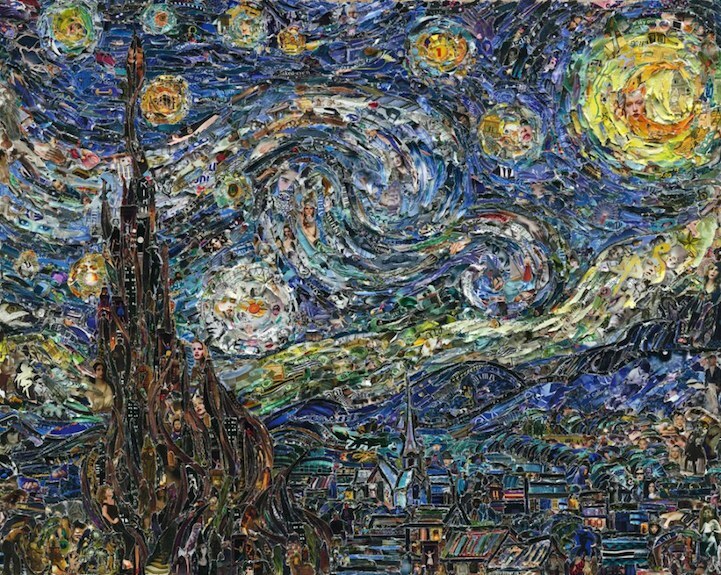 To create this picture Vik Muniz tore hundreds, or thousands of strips of magazine paper and stuck them together to recreate Starry Night by Vincent Van Gogh. I’m at this point in my career where I’m trying to step away from the realm of fine arts because I think it’s a very exclusive, very restrictive place to be. What I want to be able to do is to change the lives of people with the same materials they deal with every day. You can see some more of his artwork here. It’s great for practicing fine motor skills, when tearing the paper, picking up the pieces and sticking them down. Use it as an opportunity to observe the different colours and shades of mountains and how you can use shade to create depth to a picture. It’s a good activity for discussing shape and how to re-create the shape of mountain ranges through the tearing action. It can take a bit of practice to get the right shapes! We extended the activity by creating a collage using fabric scraps. We discussed the rough texture of the mountains and found fabric that replicated it. If you scroll through our torn paper art images at the top you’ll see some collages we made with fabric scraps and paper. We wanted to recreate the texture of the mountains. All our fabric scraps came from our local scrapstore. Scrapstores are a great place to find art materials. They collect waste materials from local businesses. You never know what treasures you might find. There is a small fee for joining. You can find your local scrapstore here. 6 Benefits of Junk modelling – Surely it’s just rubbish?! Thanks Karen. I’m glad you like it. Thanks Ann. It’s great for getting those little fingers working! Your decoupage looks fab! Such a great activity for fine motor skills practice. Thanks Carla. I’m so pleased that I introduced you to a new artist. That’s a shame! They’re so good. 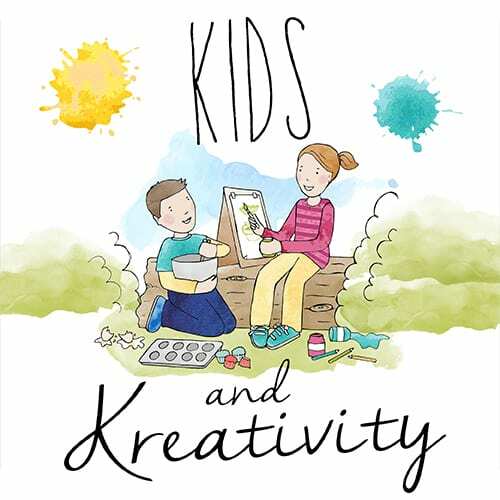 They often run creative workshops too.